Moulting flocks of common shelducks can be very large (100,000 on the Wadden Sea), since most pairs leave their partially grown young in a crèche with just one or two adults. This species is mainly associated with lakes and rivers in open country, breeding in rabbit burrows, tree holes, haystacks or similar. In winter it is common on suitable estuaries and tidal mudflats as well. The young will dive under water to avoid predators and the adults will fly away from them to act as a decoy. The range of the common shelduck is coastal northwest Europe and scattered Mediterranean sites eastwards through Central Asia to northeast China, and south to Iran and Afghanistan. Common shelducks favor coastal mudflats and estuaries, generally occurring in salt water only, particularly in Europe, but often intentionally seeking fresh water as well in order to drink. Gestation lasts 29 to 31 days. Moulting common shelduck flocks can be very large (100,000 on the Wadden Sea), since most pairs leave their partially grown young in a crèche with just one or two adults. This species is mainly associated with lakes and rivers in open country, breeding in rabbit burrows, tree holes, haystacks or similar. In winter it is common on suitable estuaries and tidal mudflats as well. The young will dive under water to avoid predators and the adults will fly away from them to act as a decoy. 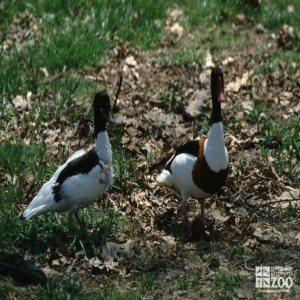 Reproduction of common shelducks starts in April or May. In single pairs or small groups; nest made of grass, moss or bracken, lined with down, in cavities such as hollow trees or rabbit burrows. Chicks have blackish down above and on thighs, white below. Mostly aquatic invertebrates (mollusks, insects, crustaceans) with predilection for salt water snail.